Martin Guptill's 34th half century in one-day internationals held together a ragged innings as England dismissed New Zealand for 223 Wednesday in the second ODI. Two early wickets to Chris Woakes, two in the middle of the innings to spinner Moeen Ali, two brilliant catches by Jason Roy and four runouts helped England take control of the match as it bowled and fielded superbly after winning the toss. Allrounder Ben Stokes also took two wickets and contributed to a run out to make an early mark on his second match after a five-month break. New Zealand, playing without captain Kane Williamson, who has a hamstring strain, lost opener Colin Munro (1) to the third ball of the second over — the first bowled by Woakes — then Mark Chapman, for 1 on debut, in Woakes' second over, leaving it 9-2. The first runout of the innings cost it Ross Taylor (10), whose century in the opening match of the five-match series on Sunday guided New Zealand to a three-wicket win with four balls to spare. Guptill subdued his attacking instinct to try to keep together an innings which was in turmoil when Taylor was out at 48-3. Guptill took 84 balls to reach a patient and generally faultless half century, then gave Roy his first catch and Ali his first wicket when New Zealand was 79-4. Roy took his second catch, from Stokes' bowling, to dismiss Henry Nichols for 1 at 82-5, leaving the New Zealand innings in a precarious state. Ali then removed Tom Latham for 22 at 108-6, accounting for the man who shared a 178-run partnership with Taylor in Hamilton three days ago. Ali bowled superbly to finish with 2-33 from 10 overs, Woakes took 2-42 and Stokes 2-42. 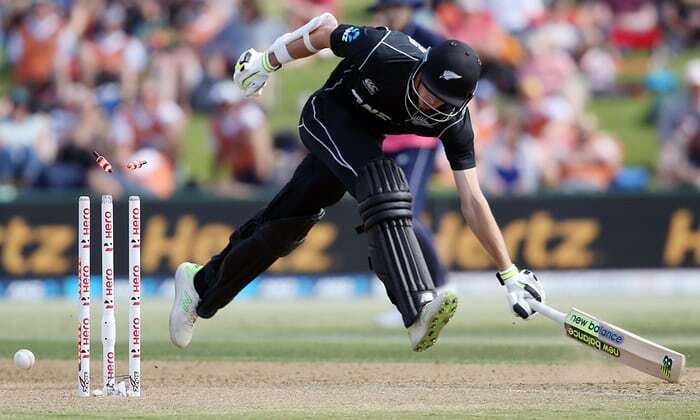 Big-hitting Colin de Grandhomme (38) and Mitchell Santner, who also played a match-winning role in Hamilton, were the last hope for a New Zealand fightback. Santner made an unbeaten 45 in the series opener to finish off the comeback that Taylor and Latham started, hitting his fourth six for the winning runs. Santner finished 63 not out when his last partner Trent Boult was run out for two in the last over.